Koi generally is a very friendly type of fish as it can learn to identify the owner who feeds them and even up to the extent of getting close to you to accept food from your palm. Normal behavior for a koi when they are first brought home released to their new pond will usually dash for cover at slightest signs of movement and shadow. This scenario is pretty normal as they have yet to accustom and getting used to the new pond. Depending on how much time you spent with your pets, usually in about a week, they will start to get to know you better and will approach and swim happily in front of your during meal time. 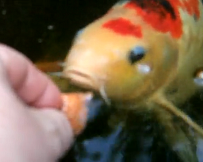 As mentioned earlier, koi fish can also be trained to hand feed from your palm and if you follow a certain fixed time schedule for their meal time, they will learn to get intimate with you. However, all is not well and it doesn’t sound alright if after weeks, they still get frightened easily as if they were meeting strangers or having the fear of getting caught. Most fish pond owners do not realize that this condition actually relates to degrading water quality as it will chemically induce the fear feeling within the fish itself. Most common example with the condition seen is when the ammonia and nitrite level builds up to unhealthy concentration. You can refer to this information on what is the tolerance level of ammonia and nitrite for water quality. If for any reason that you see this condition happening, first thing that you must do is to quickly change the water and check whether your pond filter does clog up. Conduct simple water test using test kits and find out whether ammonia or nitrite level is at unhealthy level. Sometimes even when the results turn out to be negative, there are several things which you can do to make things better. Stress coat reliever is a form of chemical produced by fish specialist which you can add to the water to calm down your fish. If you decided to try home remedy, you can always rely on salt solution to help makes thing better. Before you add any medication, first find out the volume of your pond and then calculate the amount of salt or stress coat reliever that is needed to make up to a certain concentration for it to work. Measure your pond TDO (total dissolved oxygen) level and if necessary, try to increase it by using oxydator or work on the aeration aspect by adding another set of air pumps. Another important water parameter which you shouldn’t miss out is the pH. Most people often overlook on this and in case there’s any sign of problem surfacing, pH should be one of the parameters you should check first. Koi water requirements are very close to the goldfish and the best pH range to control should be within 6.5 – 7.5. Finally, if everything else fails, there is another factor that you should look into which is the presence of predators like squirrels, rats and eagles which can harm and catch your koi. Constant harassment by these predators can make your pets particularly sensitive as it is always their natural instinct to quickly dash for cover for any presence of danger. To counter this, the best way is to use koi pond netting to make your pets feel secure.